Painters Eleven was officially formed in 1953 in Oshawa at the home of Alexandra Luke; this formation was the result of a successful show, Abstracts at Home, held at the Simpson's department store in Toronto a few months before. 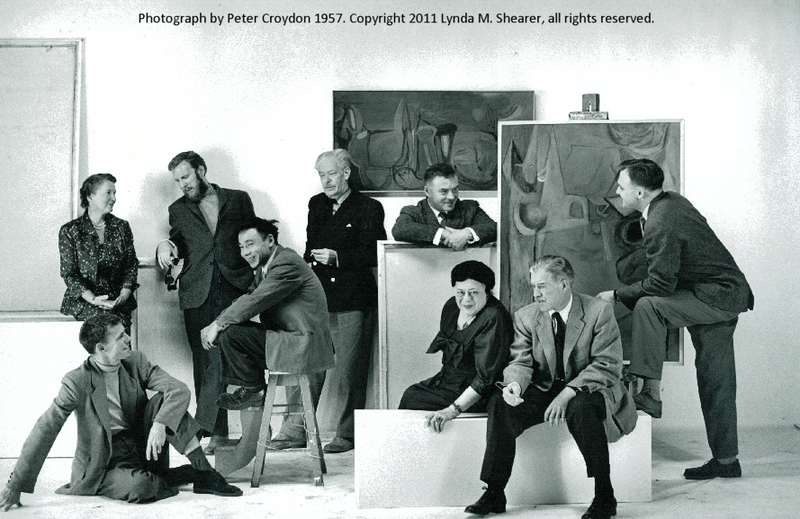 Photograph by Peter Croydon taken for a show in 1957 at the Park Gallery in Toronto, shown here includes, left to right: Tom Hodgson, Alexandra Luke, Harold Town, Kazuo Nakamura, Jock Macdonald, Walter Yarwood, Hortense Gordon, Jack Bush, and Ray Mead. The two canvases facing forward represent Oscar Cahen who tragically died in a car crash in 1956 and the canvases facing the wall are for William Ronald who had resigned from the group in 1957 and was now working in New York. Disbanded in 1960 all the surviving members went on to continue their careers and remaining true to abstraction. If you wish to inquire about selling or buying works of art, click here http://www.painters-eleven.com/contact-us inquires will be treated in confidence. Offers will be made without cost or obligation.We will travel to view major works.We purchase single items, artists' estates or complete collections. For more information on individual artists click on the names at the left of your screen. � Copyright 2008-2013 Lynda M. Shearer. All rights reserved.